Virtual characters in games are becoming more and more realistic, with recent advances for instance in the fields of skin rendering [d'Eon and Luebke 07, Hable et al. 09, Jimenez and Gutierrez 10] or behavior-based animation [NaturalMotion 05]. To avoid lifeless representations and help the user engage in the action, more and more sophisticated algorithms are being devised that capture subtle aspects of the appearance and motion of these characters. Unfortunately, facial animation and the emotional aspect of the interaction have not been traditionally pursued with the same intensity. We believe this is an important missing aspect in games, especially given the current trend of story-driven AAA games and their movie-like real-time cutscenes. We present a method to add expressive animated wrinkles to characters, helping enrich stories through subtle visual cues. Our system allows the animator to independently blend multiple wrinkle maps across regions of a character's face. 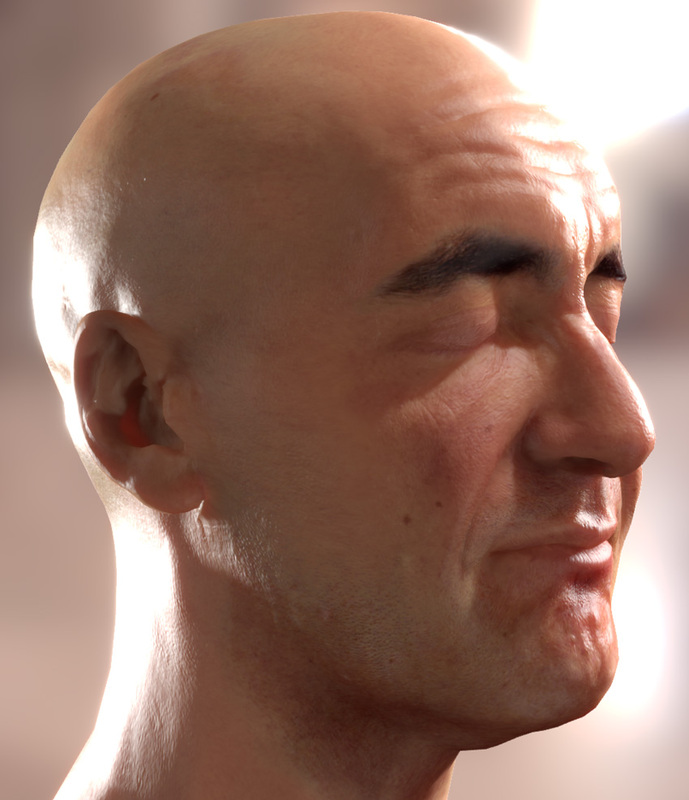 We demonstrate how combining our technique with state-of-the-art real-time skin rendering can produce stunning results that bring out the personality and emotional state of a character. This enhanced realism has little performance impact. In fact our implementation has a memory footprint of just 96 KB. Performance wise, the execution time of our shader is 0.31 ms, 0.1 ms and 0.09 ms on a low- end GeForce 8600GT, mid-range GeForce 9800GTX+ and mid-high range GeForce 295GTX respectively. Furthermore, it is simple enough to be easily added to existing rendering engines without requiring drastic changes, even allowing to reuse existing bump/normal textures, as our technique builds on top of them.